Most of you likely know the story of Mary Poppins, the magical nanny who appears out of nowhere to bring happiness to the Banks family. Although I don’t remember much about the movie, I have vivid memories of the soundtrack. My sister Gwen and I listened to the record many times when we were kids, and some of our favourite songs were on that album. We giggled along with “I Love to Laugh”, when Uncle Albert, Bert and the children floated to the ceiling with laughter. “A Spoonful of Sugar” was almost powerful enough to convince me that cleaning could be fun. I must admit that the charms of “Sister Suffragette” were lost on us, but we spent many hours singing, dancing and acting with the rest of the songs. “Ain’t it a glorious day? Mary Poppins was always right, and this time was no exception. Whether you’re a banker or a chimney sweep, a nanny or a penguin, raspberry ice cream makes every day a little more jolly. Warm the half-and-half and sugar in a medium saucepan. Pour the cream into a large bowl and set a mesh strainer over the top. In a separate medium bowl, whisk together the egg yolks. Slowly pour the warm milk into the egg yolks, whisking constantly, then scrape the warmed egg yolks back into the saucepan. Stir the mixture constantly over medium heat with a heatproof spatula, scraping the bottom as you stir, until the mixture thickens and coats the spatula. Pour the custard through the strainer and stir it into the cream. Mix in the raspberry puree and lemon juice, then stir until cool over an ice bath. Chill thoroughly in the fridge, but to preserve the fresh raspberry taste, churn the ice cream within four hours after making the mixture. 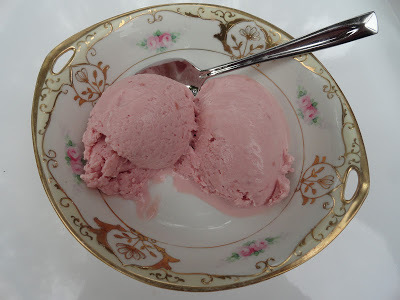 If you don’t have an ice cream machine, you can still make this recipe, using Lebovitz’s directions as follows: Pour the cooled mixture into a baking dish or bowl and put it in the freezer for about 45 minutes. Then stir it very thoroughly, so that any bits that are beginning to harden are completely mixed through. Repeat these steps every half hour until the ice cream is thick and creamy, about 2 to 3 hours. The ice cream looks amazing, so fresh and fruity! 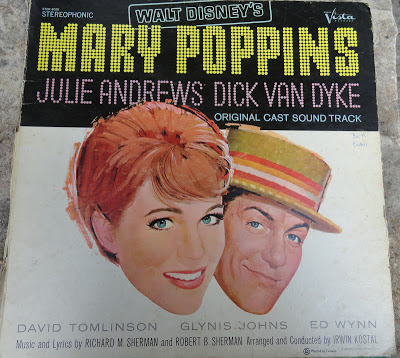 Mary Poppins is my all time favorite as a kid and I enjoyed watching it over and over with my kids. I remember that album vividly. Thanks for the sweet memories, made me smile! Yummy recipe to go with Mary Poppins. I loved that movie as a kid and watching it with my daughter. Oh I still love Mary Poppins. I use her phrase, "Practically perfect in every way" almost daily. The raspberry ice cream looks absolutely perfect. I always look forward to your matching a recipe with a movie. Many many years ago we would watch dinner and a movie. The two hosts would cook a meal inspired by the movie that was showing. It was a lot of fun! I love Mary Poppins. Great ice cream inspiration! I used to love Mary Poppins! What a great musical. Too bad musicals are scarce these days. Love the ice cream – nice flavor, great color. 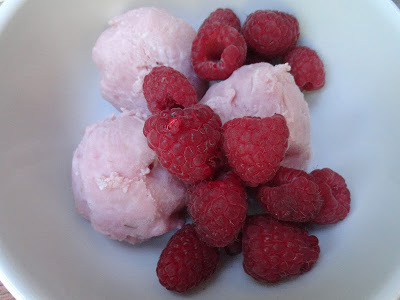 I've never made raspberry ice cream – I need to correct that immediately! Nice theme for recipe tie in, although I find it a wee bit chilly to enjoy ice cream these days! Dear Beth, I was singing right along too! My mother bought me a Mary Poppins hat and I wore it proudly to church. I would love if the kids grew up with these movies filled with fun, song and vivid imagination. I do love raspberry ice-cream and this does sound "practically perfect" as Mary Poppins would say. The Perfect Scoop is such a great book, but I haven't tried this recipe yet. It looks wonderful, especially with all the extra berries on top! Who doesn't love Mary Poppins? Is that an original booklet? Awesome! Love Mary Poppiuns Beth is one of my favorite movies love so much and the Ice cream look delicious! I think I know all the songs inside and out! But only you would find a delicious treat to share from one of them 🙂 Your raspberry "ice" looks fantastic! We have the DVD. It's funny how my kids now watch the movie I loved when I was their age. That sounds awesome! Raspberries are my favourite fruit, so I'm definitely going to try this one! Such a cute movie. I still like to watch it. Your raspberry ice cream is a perfect match, Beth! Man I haven't seen Mary Poppins in WAY too long! Such a fun musical. 🙂 I'm really craving raspberry ice cream now! Not only do I love Mary Poppins, but also all things raspberry! This is making me want a bowl of ice cream and a movie night. Thank you for sharing! I watched the movie long long time ago and quite liked it. We adore raspberries! Your ice cream looks very smooth and creamy. Mary is very wise ….so she must be right! The musical and the movie are both family favourites and so is anything sweet. This ice cream looks smooth and creamy — a perfect ending to any magical outing with penguins and parosols. Beth, this is one of the prettiest presentations of raspberry ice cream that I have seen in a long time! Picture perfect! I love raspberries! "Just a spoonful of sugar helps the medicine go down, medicine go down, medicine go down." Oh how much I love this movie. And Julie Andrews was so beautiful in this one! Every Christmas usually they play it on the tv and I always watch it like it is the first time! The ice cream is the perfect dessert that matches this beautiful all time classic movie! what a cute recipe tribute to Mary Poppins! And as a HUGE raspberry ice cream lover, i'd love a bowl of this! Mary Poppins…one of my favorite all time movies! Starting to sound like my Dad when I say, they don't make 'em like that anymore! This ice cream looks heavenly. I've wanted to try one of his ice cream recipes but have been hooked on Jen's recipes. Oh I love Mary Poppins 🙂 I haven't seen that movie in forever, this makes me want to watch it. That ice cream sounds so good, I can't wait to try it, I might try to make it sugar free for me. Sounds so rich and divine. I love the simple joy of Mary Poppins – perfectly captured in this classic ice cream flavour!